I flooded you with a lot of pictures, I know...asking you what seemed 'off' in the images. This picture is the best example of what is bothering me (QUICK! Look again one more time). My intent, I assure you, was not to create a cliff-hangar of a post (though what a great idea!) that would cause my fellow gardeners to lose sleep and neglect loved ones. Oh, no. Mostly, and more importantly, it was to see if some of you, ANY of you, share my sometimes warped, overly obsessed way of looking at things. "Love the dark color of the wood, but my eye kept going to the unpainted fence – got any more paint? Larkspur would pop against the dark brown (black-eye susans as well) OR do you think it would be too much brown?" In other words, my darlings, the area looks unfinished. Truncated. Not completely thought out or carried out. Actually, truth be told, this whole unpainted fence when the rest of the adjoining wood structures are painted - er, stained - thing has bothered me from the very beginning. I even hesitated about the whole idea because I knew that once I got started...I wouldn't know when and where to stop. (Staining that is, not obsessing. Well, that too...) And that so much darker wood would look too oppressive and would be too expensive and be too much work. And I think I was right about my reservations. It looks, I told Bubba, discordant. Not in harmony. Decidedly, un-feng shui. But you will be VERY relieved to know (having lost sleep and all) that I think I have a solution, arrived at after some brainstorming with Bubba. The fence portion in the 'room' of the potager will be stained a lighter shade of the same color, so it doesn't seem too oppressive, or unfinished, or un-harmonious, god forbid. 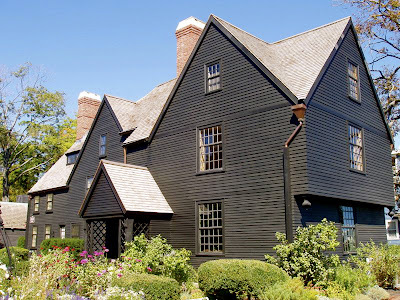 House of the Seven Gables, Salem, Mass. Made famous by Nathaniel Hawthorne.